Autumn Creek Flagstone, Ledge and Natural Ledge stones, and boulders: color ranges from light browns with hints of gold and a touch of gray on the surfaces with a gray body. 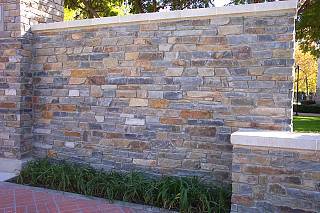 Autumn Creek Snapped Ledge Stone: consistent gray color, with light browns and hints of gold. Residential or commercial applications for paving walkways, patios entries, floors, decks driveways; veneer for interior or exterior walls, columns, fireplace faces, chimneys, barbecues, planters, waterfalls, water features, ponds, swimming or natural pools; capping of walls, seats, stair treads, lampposts, column cap, pool and spa coping, water tables, and sills. Slabs may be used as diving rocks in swimming areas, monumental decorations, and outdoor tables. Boulders used as landscape accents. Flagstones 1¼" minus; select: 1" - 2¼" and patio: 1" - 2¼" and 2" - 3"